In urging him on, Scarborough had promised, “You fall down I’m going to catch you.” But he didn’t catch him. Not a word protesting the suspension or owning up to his responsibility. 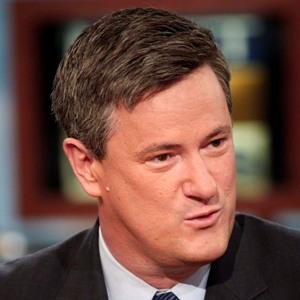 From Joe Scarborough, a betrayal of a colleague’s trust, craven refusal to accept accountability for leading Halperin into his error with the promise that he would be backed up, a cowardly deflection of responsibility onto his producer, and, apparently, unwillingness to share the blame for an incident that he encouraged, and that got Halperin suspended. This entry was posted on July 1, 2011 at 11:18 pm and is filed under Apologies, Entertainment, Ethics-general, Media, Politics. You can follow any responses to this entry through the RSS 2.0 feed. You can leave a response, or trackback from your own site.